Photo taken near Prunedale by Dean W. Taylor. A. pajaroensis growing over A. hookeri ssp. hookeri on a shallow-soiled ridge in maritime chaparral. This fact sheet was prepared by Grey Hayes and Dean Taylor under award NA04N0S4200074 from the National Oceanic and Atmospheric Administration (NOAA), U.S. Department of Commerce (DOC). The statements, findings, conclusions, and recommendations are those of the authors and do not necessarily reflect the views of the NOAA or the DOC. Arnold series soils (derived from the Aromas Sands Formation) in maritime chaparral or around the edges of or under sparse canopy of coast live-oak (Quercus agrifolia var. agrifolia) woodland. In the Prunedale hills, after a long period without fire and consequent overtopping by oaks, it occurs for the most part on ridges where soil depth and development are comparably shallow; 30-760 m.
Erect shrub to 4 m, without basal-burl, old stems gray, bark shredding, persistent; twigs short-nonglandular-hairy, hairs occasionally long; leaves overlapped, petiole < 2 mm, blade 2–4 cm, 1–2 cm wide, ovate to triangular-ovate, abaxially light green, glabrous, adaxially dark-blue-green, glaucous, base lobed, clasping, stomata on lower leaf surface; inflorescence paniculate, 2–5-branched, bracts leaf-like; fruit sparsely non-glandular-hairy to glabrous (Parker et al. 2013). Only auriculate-leaved manzanita within its geographic range, but similar in habit to the Santa Cruz Mountains manzanita (A. andersonii), which occurs to the north in the Santa Cruz Mountains. December to February (identification possible throughout the year). Manzanita Park, Long Valley (Elkhorn Slough Foundation conservation property) (Monterey County). Endemic to central California in Monterey, San Benito, and Santa Cruz (presumed extirpated) counties (CNPS 2010). The Larkin Valley location in Santa Cruz County documented by a single 1935 specimen is now a residential development and was not relocated by Griffin (1978); much suitable habitat in that region was "conserved" in the 1930s by plantations of exotic Eucalyptus globulus and southern California natives Torrey Pine (Pinus torreyana) and lemonade berry (Rhus integrifolia), eliminating maritime chaparral ecosystems. The two CNPS (2010) reports from Davenport quad in Santa Cruz County are almost certainly misidentifications of A. andersonii. This species requires fire to regenerate from viable seed buried in the soil. The exact triggers for germination are unknown, but may (as with other manzanitas) include a combination of both heat and chemicals from charred wood or smoke. The fire frequency necessary for stable populations is also unknown but is probably on the order of 80–100 years. Fragmentation of the habitat by housing may make utilization of controlled fire impossible. Stands in the Prunedale region have declined owing to residential development and fire suppression (Davis 1972, Griffin 1978). One stand near Prunedale visited by Roof (1980) in 1964 and 1966 is confirmed extirpated by residential subdivision. The status and abundance on the Elkhorn Slough Foundation conservation lands requires field determination. The species is extensively used in cultivation, especially the cultivar 'Sunset' (a hybrid between A. pajaroensis and A. hookeri ssp. hookeri), which was originally collected at Manzanita Park and 'Paradise,' collected along Paradise Road. 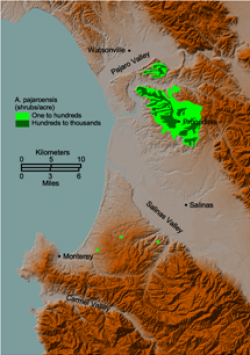 While researching the distribution of A. gabilanensis in the early 2000s, a small, hitherto unknown population of A. pajaroensis was located by Parker and Vasey (2004) in the Gabilan Range, on a ridge adjacent to the Salinas Valley. This occurrence is approximately 12 miles from the nearest perviously known population and added San Benito County to the species' range (Parker and Vasey 2004). Exotic, invasive weeds also threaten the species throughout its range, especially jubata grass (Cortaderia jubata), iceplant (Carpobrotus spp. ), French broom (Genista monspessulana), and blue gum eucalyptus (Eucalyptus globulus). Abrams, L. 1951. Illustrated flora of the Pacific states, volume 3. Palo Alto. Stanford University Press. California Native Plant Society (CNPS), Rare Plant Program. 2010. 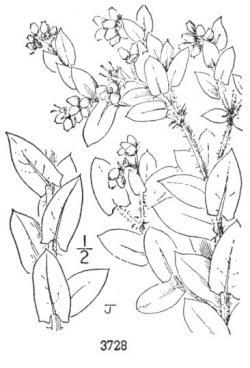 Arctostaphylos pajaroensis, in Inventory of Rare and Endangered Plants (online edition, v8-02). California Native Plant Society, Sacramento, CA. http://www.rareplants.cnps.org/detail/32.html [accessed 1 February 2015]. Davis, C. B. 1972. Comparative ecology of the Arctostaphylos andersonii complex. Ph.D. Dissertation, University of California, Davis. Griffin, J. R. 1978. Maritime chaparral and endemic shrubs of the Monterey Bay region, California. Madroño 25:65–112. Parker, V. T. and M. C. Vasey. 2004. 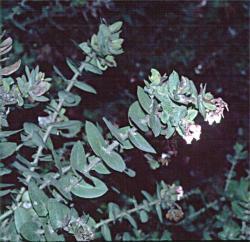 Arctostaphylos gabilanensis (Ericaceae), a newly described auriculate-leaved manzanita from the Gabilan Mountains, California. Madroño 51(3):322–325. Parker, V. T., M. C. Vasey, and J. E. Keeley. 2013. Arctostaphylos, in Jepson Flora Project (eds.). Jepson eFlora, http://ucjeps.berkeley.edu/eflora/eflora_display.php?tid=13961 [accessed 1 February 2015]. Roof, J. B. 1980. Changing Seasons 1(3):2–31.